HMD Global is already preparing its 2018 lineup which includes the flagship Nokia 9, the Nokia 6 (2018), Nokia 1, and a 4G enabled Nokia 3310 as various leaks suggest. And while the flagship Nokia 9 is yet to be made official, rumors are already beginning to swirl about HMD Global’s next premium device – the Nokia 10. 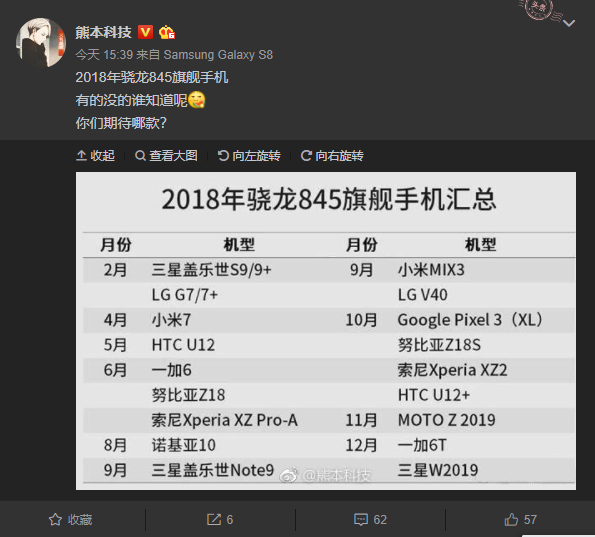 A leaked image from out of China containing the list of devices expected to ship with the recently unveiled Snapdragon 845 surfaced earlier today. The Nokia 10 is HMD Global’s only device that made it to the list, and as per the list, the Nokia 10 should be due for release by between July and September 2018. Launching the Nokia 10 with Snapdragon 845 does make some sense, but the big question is why not on the upcoming Nokia 9, knowing that some of the flagships it would be pitted against in 2018 will be coming with the revered chipset. Well, the most logical response to that could be that the Nokia 9 may have been intended to debut much earlier than January 2018 but was deferred for logistics or development problems. Rumors about the Nokia 10 is just beginning to creep in, so we presently don’t know a lot about the device, but it is expected to come with an improved Carl Zeiss snapper on the back and an 18:9 display with slimmer bezels. HMD Global may decide to use the in-display fingerprint sensor or go the path of Apple by dropping the fingerprint sensor in favor of the 3D face unlock technology, similar to FaceID been rumored for the Xiaomi Mi 7. I hope this device will be Worth using. I just hope they have improved. Nokia is realy trying nowadays! And i know by God garce they will regain their strength!